Our safe arrival in the Marquesas, French Polynesia seemed somewhat of a miracle given the precarious location and nature of the airstrips here. The rugged and mountainous terrain of these islands must be a nightmare for airline pilots and airport engineers. After three stops and one plane change from Tahiti, we finally landed on Ua Huka (one of the five inhabited islands of the Marquesas). Our landing on Ua Huka began with the pilot flying what seemed to be directly at the ground before leveling out at the last second to land on the island’s airstrip that slopes down toward the coast. It reminded me of the Big Dipper, a famous roller coaster in the city of Santa Cruz, California, where Island Conservation’s headquarters can be found. 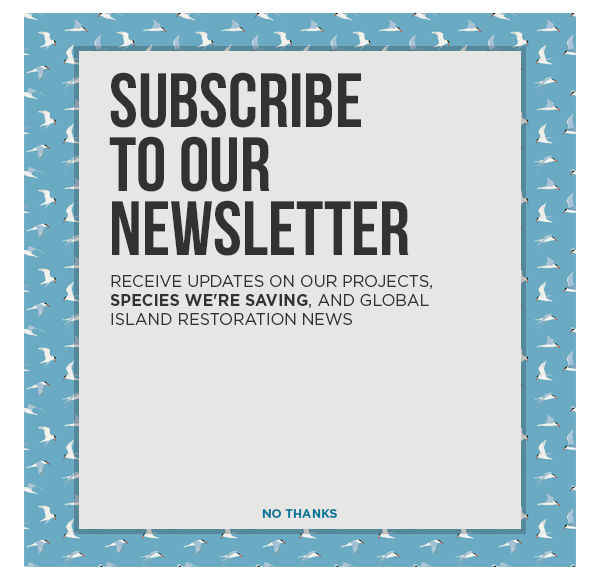 Our mission in the Marquesas is to assess the feasibility of removing invasive rats, cats, pigs and sheep or a combination thereof from eight uninhabited offshore islands, most of which support one or more endangered land birds or seabirds. We are working with staff from Société d’Ornithologie de Polynésie (the Ornithological Society of French Polynesia or Manu) and BirdLife to visit each of the sites, obtain information necessary to complete the assessment, and understand the community’s interest in seeing the project proceed. Our work was to begin with the removal of Pacific rats from Teuaua, a small island off the coast of Ua Huka that is accessible only by climbing from a boat onto a small ledge and then scaling a near vertical cliff aided only by a rope. However, once again we have been foiled by the Sooty Terns that stubbornly refuse to pause their breeding efforts on the island. The operation has now been rescheduled for May or June. We will use the extra time to gather more baseline information from Teuaua and the nearby rat-free island of Hemeni, and to engage in dialogue with the community about protecting Teuaua from future rat re-invasion. Next stop is Nuku Hiva (the largest of the inhabited islands), which will be our launching pad to get to the islands of Eiao and Hatuta’a. Hatuta’a supports populations of Phoenix Petrel, maybe Polynesian Storm-petrels, and the Marquesan Ground Dove despite the presence of Pacific rats. Eiao, on the other hand, has invasive pigs, sheep, feral cats and Pacific rats so we don’t know quite what we expect to find in terms of remnant biodiversity.